It is nice sometimes to be able to look back at a day or an event that you have experienced and say "I think that was just about perfect". It falls to me to write few words about the game held in memory of Simon King who was so missed last season. As you may know, Simon was at Frenchay Hospital in the head injuries unit run by 'The Headway Trust'. The Trust is leading the way in research and development of new techniques to help brain injured people in this country. As way of showing our gratitude to all those at the hospital who cared for Simon, it was decided to hold a fundraising game at Chew Court, the proceeds of which would be donated to the Trust. 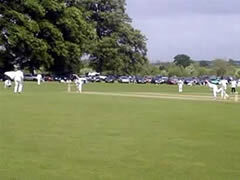 The game was between a team of Chew Magna players, past and present, and a team of local cricketers from the Somerset League who Simon had played against over the years. All those who were asked to play responded positively and we were able to field two teams, some of whom had travelled some distance. We thank all those who took part. The day itself was a great success and everybody enjoyed themselves. The weather was great and the bar and refreshments did a roaring trade. Once again, thankyou to all those who helped out. The reason we all got together was Simon and his love for not just cricket, but for all sport. If it could ever be said that someone was a 'one off' it could have been said about Simon. He was as talented as anyone who ever took to the field to represent this club, yet in the same moment could be as infuriating as the best of us. He had that little spark of genius that sometimes puts things in a different perspective, but put a bat in his hand or a ball at his feet and that was where he showed what really mattered to him. Even his nickname 'S' was not run of the mill. His other talent was to make people laugh or cry, depending on your viewpoint. He would usually have us all in fits of laughter at some point during a game, which would perhaps mask his competitiveness. But make no mistake, he played hard and played to win and would be as sad as the next man when we lost. Still, nothing that a few beers would not put right. That was the way he played the game, which in itself is an admirable philosophy. 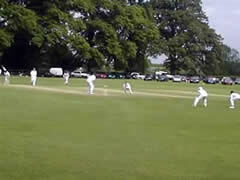 One game summed up Simon more than any other and treated the players of both teams to an exhibition of batting the like of which has never been at Chew before and it will be a long time before we see one like it again. The game was a league match against Wellington, chasing 241 on a slow wicket and in fading light things looked bleak until Simon went in. He smashed the ball to all parts scoring 161 not out. On returning to the pavillion after hitting the winning boundary, his cheeky grin and laid back air was just typically Simon. No one else could have done what he did, but we never heard him re-telling the innings day after day. For him it was just another game, just another chance to be with his mates. That is the way we all want to remember Simon, and that is the way I am sure he would have wanted it. Wellington Cricket Club for their very kind gesture of the framed scorecard of S's club record 161 no against them in 1996. Fred Evans for organising and running the barbecue. Rhona Thomas for the raffle. Alex and Sam Locke, Will Broderick, Rachel, Laura and Katherine Witcombe for selling tickets. Chew Valley Rugby Club for keeping the bar running with regular deliveries and the following for donating raffle prizes. Somerset County Cricket Club - Family Ticket. Sincere apologies to anybody we have forgotten to mention.